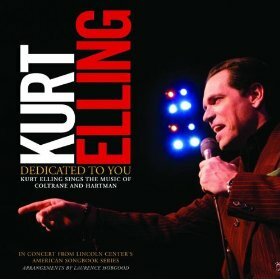 Jason Crane interviews vocalist Kurt Elling. Known for his affinity for the music of John Coltrane, Elling’s new album, Dedicated To You (Concord, 2009), is his most explicit tribute yet. The album features the music of the classic Impulse recording John Coltrane & Johnny Hartman, performed here with saxophonist Ernie Watts, the Laurence Hobgood trio, and a string quartet. Elling discusses the genesis of the project, how he adapted this famous repertoire, and his role as an interpreter of the music. Pingback: The Jazz Session » Welcome Tanglewood Jazz Fest fans!